One of my favorite projects was my kid painted dresses from a few years ago where I had the nieces paint on fabric and then I sewed them dresses from the fabric. It was so fun and they proudly wore them. Now that they’ve been really getting in to drawing I thought it would be fun to do a spin on that project. 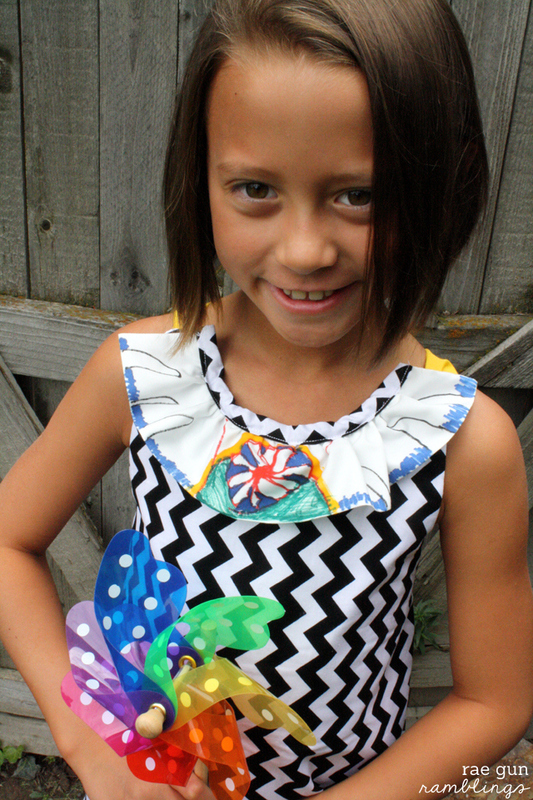 My friend Veronica of Sew Very released her awesome Sunny pattern and I thought the neck ruffle provided the perfect canvas for my little artists. I showed them both the picture of the pattern and they got excited. This was so easy. 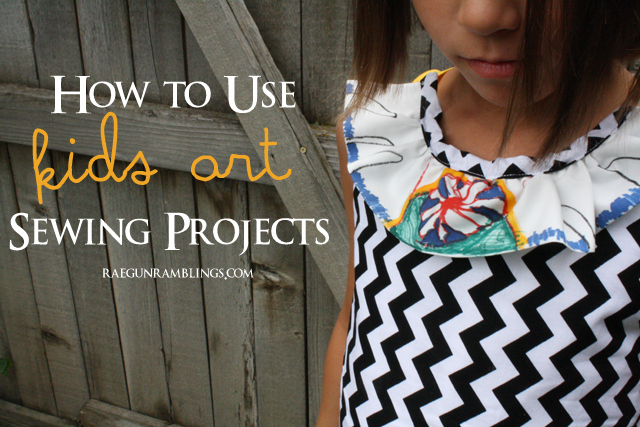 You can have your kiddos design some fabric to integrate into your sewing either for their own garments like I did or how fun would it be to make something up for grandma our your favorite teacher. But I do have some tips to set you up for success. 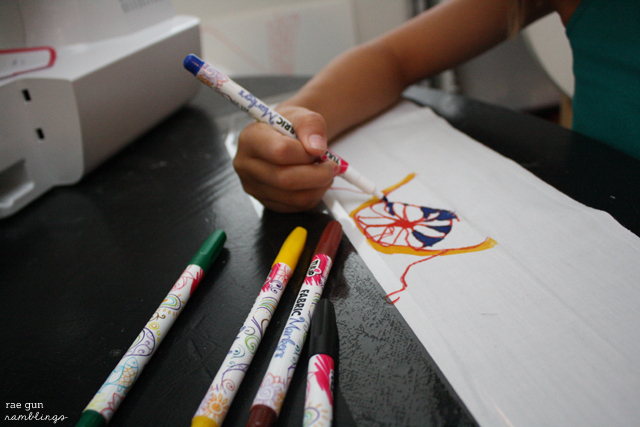 Start by picking a project that has a section you’d want to feature kid art. I recommend starting small like the neck ruffle, a pocket, or border hem. 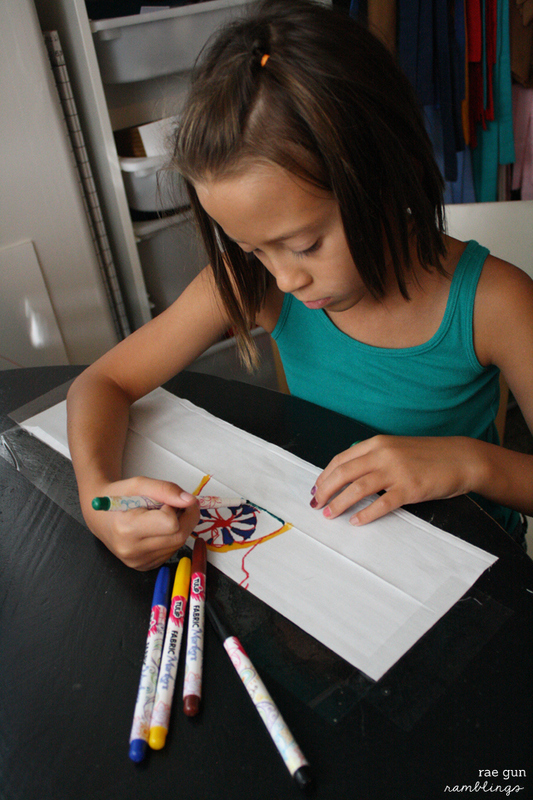 Cut the pieces out and then tape the piece you want them to decorate right side up to a table. This will stabilize the fabric making it easier to draw on. I also recommend taping over any space that you need for seam allowances (you don’t want to cut off their masterpiece). I did not do this but both girls made designs that had a center so I wish that I wish that I would have marked the center on their fabric. T’s was a bit off so I just hacked off some of one of the ends of the ruffle so it would fall more center. Then let them go at it! After that all you have to do is assemble your project like normal. Now a little about the Sunny pattern. It comes in both a top and a dress with an option for ruffle and one without. I did both dresses with ruffles since that’s what the girls picked. It came together super fast. The directs are really clear and I think this would be a doable project for a beginner. I think the girls might be able to sew their own with a little help on the ruffle part so I think an adult beginner with a little patience can totally do this. T is 7.5 and L is almost 6 and based on their measurements I sewed up the size 6 and 7 and I think it fit them really well. After I was done taking pictures T said “this is really comfortable I’m going to just keep it on” yay. Really there’s not much more you can ask after you sew a kiddo something than that they actually WANT to wear it. 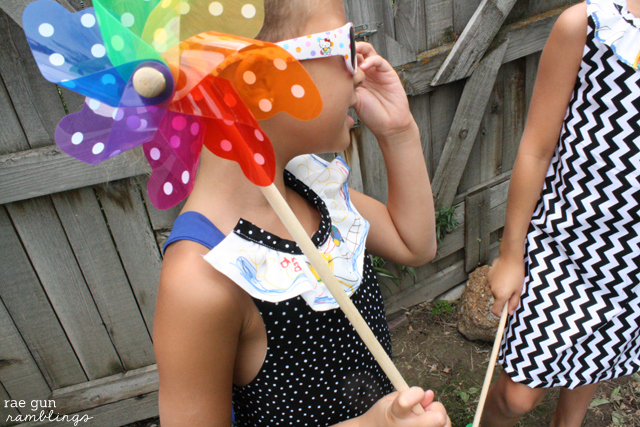 Enter to win your own copy of the Sunny Dress and Top Pattern in the rafflecopter widget below! Thanks so much to Veronica for inviting me to try out your pattern! And if you want to sew your own you can get yours here. 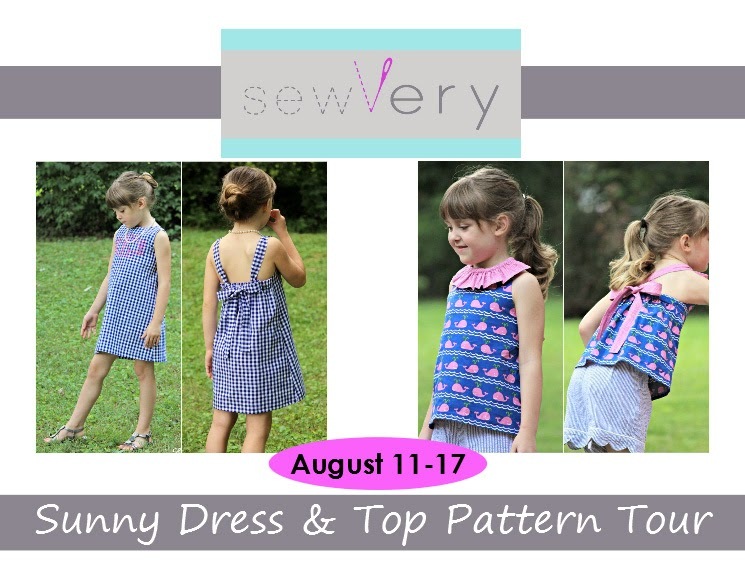 And as a part of the pattern turn August 11th – 17th, use code SUNNY20 at checkout to save 20% off the regular price when you purchase the sewVery Sunny Dress & Top Pattern. 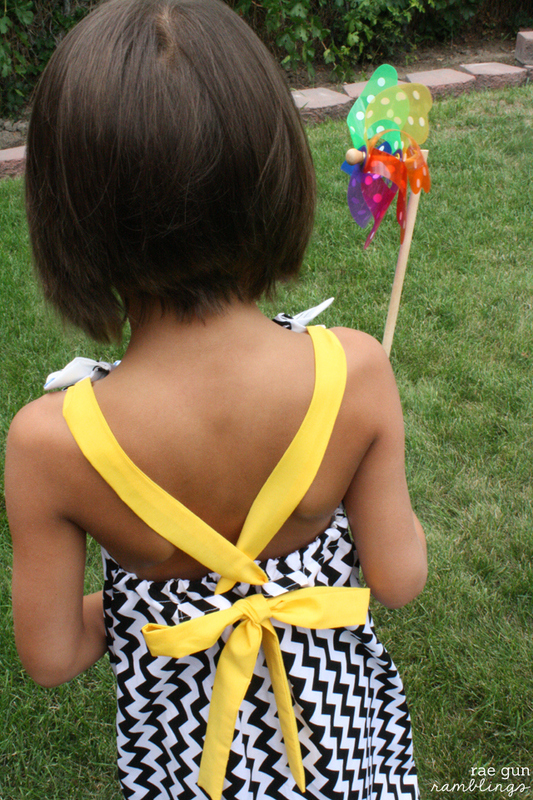 Be sure to wee how the other bloggers sewed up this pattern too! I will definitely have to pick up some of these markers at the store and let me kids have a go at designing their own fabric. 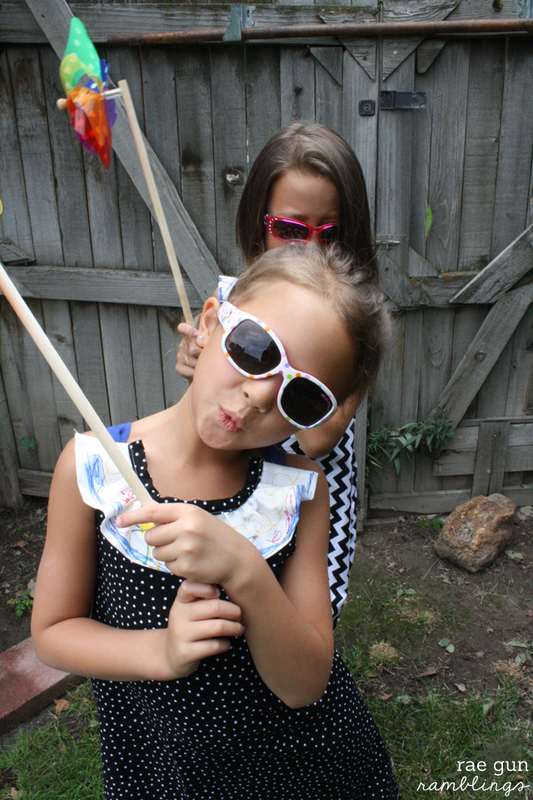 What a fun way to get the girls excited about sewing and designing! I love the black and white fabrics used as the backdrop to their masterpieces. They both look great, and it is always a plus when they really want to wear it after the photo shoot! Thanks for being part of the tour!